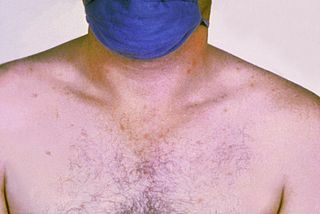 Relapsing fever is a vector-borne disease caused by infection with certain bacteria in the genus Borrelia, which are transmitted through the bites of lice or soft-bodied ticks. Panton–Valentine leukocidin (PVL) is a cytotoxin—one of the β-pore-forming toxins. The presence of PVL is associated with increased virulence of certain strains (isolates) of Staphylococcus aureus. 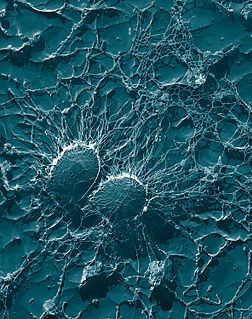 It is present in the majority of community-associated Methicillin-resistant Staphylococcus aureus (CA-MRSA) isolates studied and is the cause of necrotic lesions involving the skin or mucosa, including necrotic hemorrhagic pneumonia. PVL creates pores in the membranes of infected cells. PVL is produced from the genetic material of a bacteriophage that infects Staphylococcus aureus, making it more virulent. 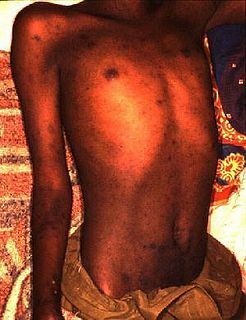 Pneumocystis pneumonia (PCP) is a form of pneumonia that is caused by the yeast-like fungus Pneumocystis jirovecii. It is also known as PJP, for Pneumocystis jiroveci Pneumonia. Vinckeia is a subgenus of the genus Plasmodium — all of which are parasitic alveolates. The subgenus Vinckeia was created by Cyril Garnham in 1964 to accommodate the mammalian parasites other than those infecting the primates. Leptotrombidium is a genus of mites in the family Trombiculidae, that are able to infect humans with scrub typhus through their bite. The larval form feeds on rodents, but also occasionally humans and other large mammals. They are related to the harvest mites of the North America and Europe. Renaud Piarroux is a pediatrician specializing in infectious diseases and tropical medicine. From 2008 to 2017, he has been a Full Professor of Parasitology and Mycology at the University of Aix-Marseille in Marseille, France, and Head of Parasitology and Mycology at Assistance Publique-Hôpitaux de Marseille. Since 2017, he has been a Full Professor of Parasitology and Mycology at the Sorbonne University in Paris, France, and Head of Parasitology and Mycology at Assistance Publique – Hôpitaux de Paris. Over the years, Piarroux has taken part in several missions and research projects in Africa, including the study of the dynamics of cholera epidemics in Comoros, Democratic Republic of Congo and Guinea, prevention and management of parasitic diseases in Morocco, and a program to fight against waterborne diseases in Ivory Coast. ↑ Bechah Y, Capo C, Mege JL, Raoult D (July 2008). "Epidemic typhus". Lancet Infect Dis. 8 (7): 417–26. doi:10.1016/S1473-3099(08)70150-6. PMID 18582834. ↑ Reynolds MG, Krebs JS, Comer JA, et al. (October 2003). "Flying squirrel-associated typhus, United States". Emerging Infect. Dis. 9 (10): 1341–3. doi:10.3201/eid0910.030278. PMC 3033063   . PMID 14609478.